Msgr. Joseph Sun Jigen, an official priest, was secretly ordained in 2011. Although approved by the government, the installation ceremony was canceled at the last moment for fear that illicit bishops would attend. At today's ceremony, the vice-president of the Council of Bishops was absent having suffered a heart attack; the vice-president of the Patriotic Association was absent because in mourning. Immediately following his installation, the Lanzhou bishop brings priests and nuns in "pilgrimage" to Jinggangshan, the cradle of the Communist Revolution in Jiangxi. Handan (AsiaNews) - Msgr. Joseph Sun Jigen was today recognized by the Chinese government as the bishop of Handan (the ancient Yongnian in Hebei). The installation ceremony took place today in a small rural church in Shexian County, presided over by Msgr. Hengshui Pietro Feng Xinmou (the ancient Jingxian, again in the north of Hebei). There were no illicit bishops present at the rite (photo 1). Msgr Sun is a member of the official Church and was appointed bishop by both the Holy See and the Chinese government a few years ago. His episcopal ordination was scheduled on June 29, 2011, but was called off at the last moment: the faithful did not want the illegitimate bishop, Msgr. Joseph Guo Jincai of Chengde (Hebei) to attend the ceremony. Meanwhile, on June 21 of that year, Msgr. Sun was secretly ordained bishop coadjutor of the diocese. 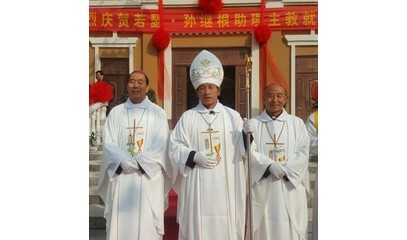 Bishop Fang Jianping of Tangshan, vice-president of the Chinese Bishops' Council, should have presided over the ceremony. But four days ago he suffered a heart attack and was taken to Beijing for treatment. Msgr Guo Jincai, vice-president of the Patriotic Association, should have replaced Msgr. Fang, but he could not attend "because of his mother's death," according to a local ecclesial source, who added: "We thank the Lord for taking care of our diocese." Since the government authorities had planned the presence of an illicit bishop, only 60 priests out of 90 of the diocese and only 100 faithful took part in the installation. 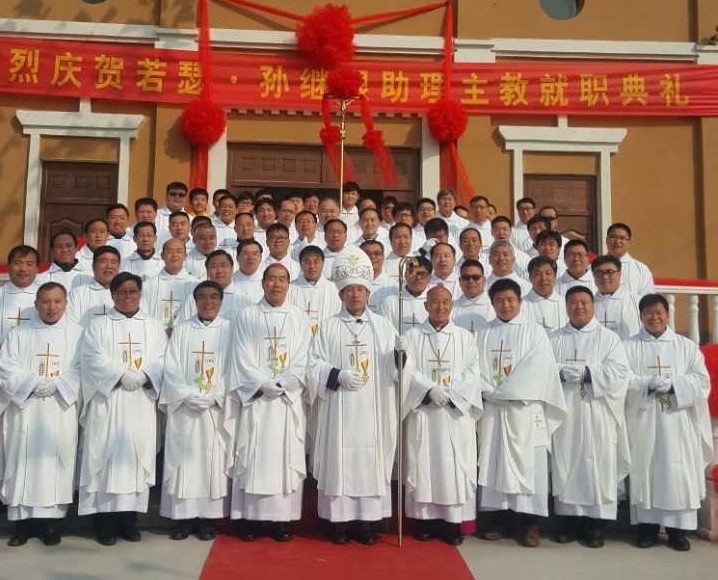 The diocese chose a rural church for the ceremony to avoid irrational reaction from the faithful and tried to block the news of the installation from the majority, said a lay Catholic in Handan who asked for anonymity. But he ridiculed that if there is irrational reaction, a handful of laypeople is enough to cause troubles. Hebei is the largest Catholic province in China with about one million faithful and a stronghold of the underground Church community. Handan, an active diocese, has a Catholic population of 180,000 but Shexian county has only 500, with mostly are new baptized. Born on 2 August 1967, Bishop Sun entered Handan diocesan minor seminary in 1986. In 1994, he taught in the minor seminary. In 1995, he was ordained into the priesthood by the late Bishop Chen Bolu of Handan. In 1997, he was appointed chancellor, and between 2001-2005, he was named vicar general. In 2005, he was named parish priest in Yongnian. In 2007, he was appointed bishop-designate of Handan by the Holy See. The name of Msgr. Sun then underwent the electoral process required by the government, where they vote for candidates for the episcopate. But Catholics knew that the election was false, in the sense that the constituents of the committee would vote and support only the candidate approved by the Vatican. Between 1998 and 2008, Msgr. Sun was also a member of the government’s political consultative conference. The installation of Msgr. 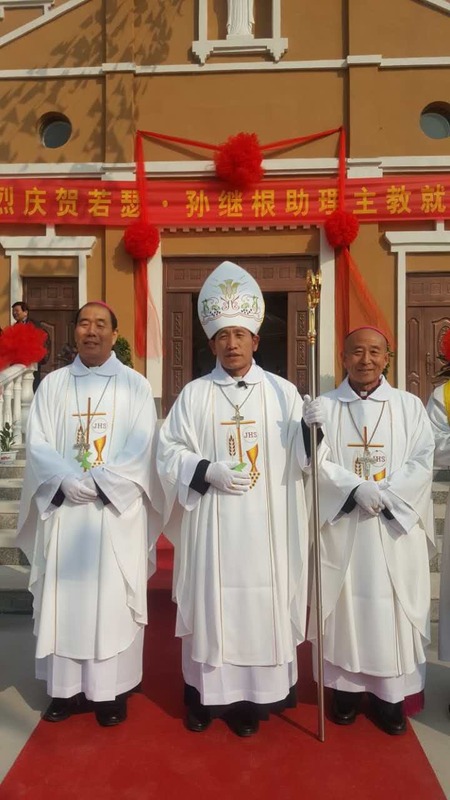 Sun differs from what occurred on November 10 in Lanzhou for bishop Joseph Han Zhihai. He was an underground bishop who became official. According to news from his diocese, the day after his installation, Msgr. Han accompanied "a pilgrimage" of a group of priests and nuns in Lanzhou, Pingliang and Tianshui (Gansu) to Jinggangshan (Jiangxi), considered the cradle of the Communist Revolution, the starting point of the Long March (picture 3).